After a lengthy courtroom battle, the largest YouTube to MP3 stream ripper has agreed to take the full blame for copyright infringement. Each day, millions of people head to YouTube-mp3.org to rip their favorite videos into MP3 files. Now, in a proposed settlement agreement, site owner Philip Matesanz has agreed to shut down the popular site. The operators of YouTube-MP3.org, a popular website for turning the audio tracks of YouTube videos into MP3s, have agreed to shut down the site and hand over the domain to the RIAA. This predictable outcome comes after 15 of the world’s largest record companies filed a complaint in a California court. Poor little YouTube-MP3.org never had a chance. It’s actually remarkable that YouTube-MP3.org even survived this long. The website’s sole purpose is enabling users to download audio tracks that they don’t have permission to download. This practice is commonly known as “stream ripping,” and record companies have said that it’s bigger than piracy. In the case of, say, the latest Taylor Swift single (which is awful by the way), YouTube-MP3.org lets you rip the song in a matter of seconds. No need to buy it on iTunes or, God forbid, at a record store. Everything is free on the internet. Until it’s not. While YouTube-MP3.org is hardly the only stream ripping service on the internet, it is one of the most popular. According to Alexa traffic statistics, YouTube-MP3.org has been in the top 400 most visited websites in the world for well over a year. This might be why record companies decided to take YouTube-MP3.org to court. And just to drive this point home: YouTube-MP3.org never had a chance. Faced with the armies of lawyers that companies like Capitol Records, Sony Music, and Warner Brothers Records can employ, a simple little website like this one would be lucky to last a week. 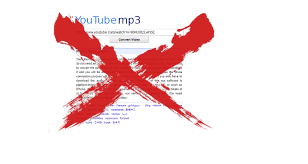 It’s been almost year, however, since the consortium of record companies first sued YouTube-MP3.org. In the end, the parties decided on a settlement rather than letting a judge decide the website’s fate. In addition to shutting down YouTube-MP3.org and handing over its domain, a proposed final judgement submitted Friday states the owners of the site will pay the record companies an undisclosed sum and refrain from “knowingly designing, developing, offering, or operating” any other infringing stream ripping service. For now, YouTube-MP3.org is still up, although its closure is surely imminent. That means users will have a few more hours or even days to download free music from YouTube. And once YouTube-MP3.org goes away, they’ll have to use another service until that one gets shut down by the record companies. The RIAA can play this game of whack-a-mole forever. After all, it’s been doing this since the Napster days.